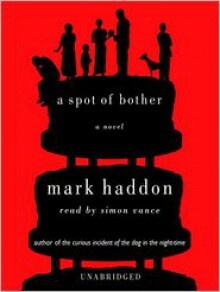 Mark Haddon's first adult novel, The Curious Incident of the Dog in the Night-Time (2003), left appreciative readers wondering what he could do as a follow-up. A Spot of Bother germinates from a troubling speck on the body of 61-year-old George Hall. This retired baby boomer is convinced that the nearly invisible token heralds the onset of cancer. When he is unable to convince family or physicians of his doubtful self-diagnosis, he spirals into near madness. As George is renegotiating his relationship with reality, his wife is cavorting with another man; his divorced daughter is contemplating remarriage; and his gay son toys with the idea of coming out in public. A three-ring domestic comedy handled with aplomb.